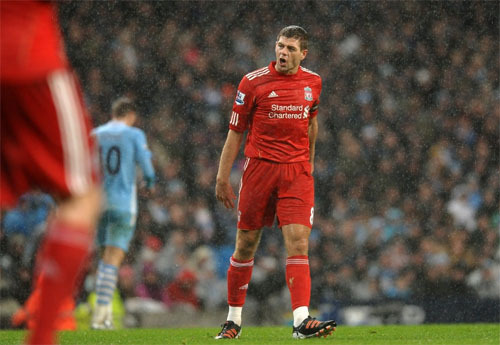 Liverpool were unable to start the New Year with a win as they were beaten 3-0 by Manchester City at the Etihad Stadium on Tuesday night. The hosts took the lead with just 10 minutes on the clock when Sergio Aguero's effort from 20 yards bounced under the dive of Pepe Reina to find the target. Liverpool responded well to the setback, but City doubled their lead just after the half-hour mark when Yaya Toure rose highest to head home David Silva's corner kick via the underside of the crossbar. 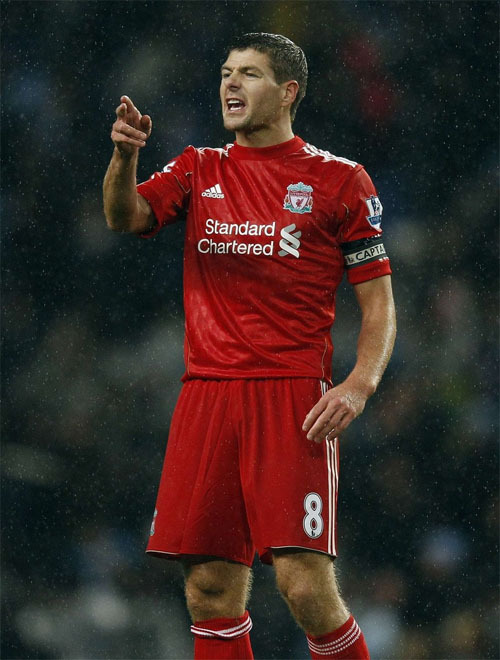 The Reds dominated possession in the second half as they looked to stage a fight back, with Steven Gerrard and Craig Bellamy coming off the bench. 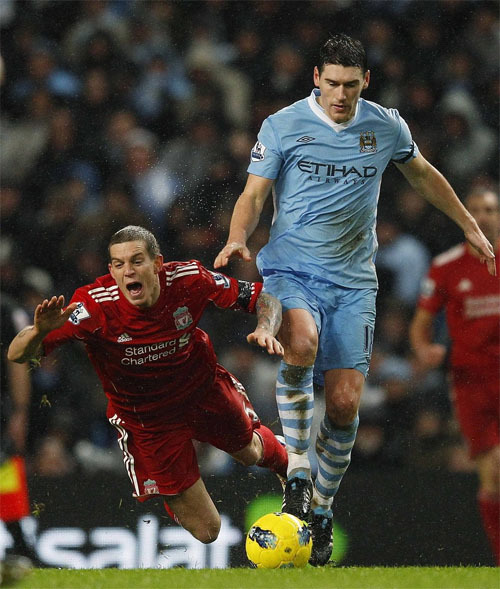 City were reduced to 10 men on 73 minutes when Gareth Barry picked up a second booking, but James Milner's penalty two minutes later secured the result for Roberto Mancini's side. Kenny Dalglish opted to make just one change to the side that had begun against Newcastle United on Friday night, with Dirk Kuyt returning to the starting XI to replace Bellamy. 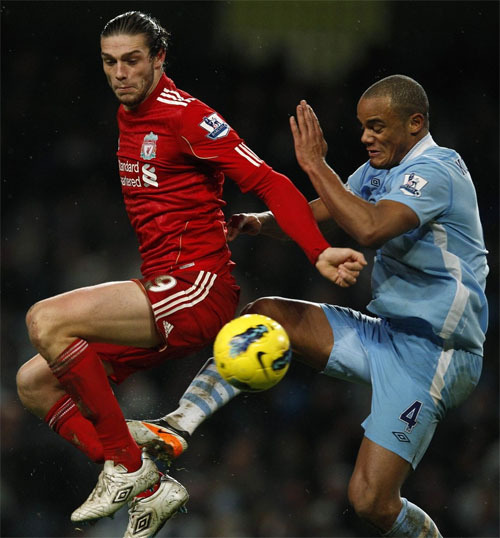 Meanwhile, City made six alterations to their team selection from the New Year's Day defeat at Sunderland. 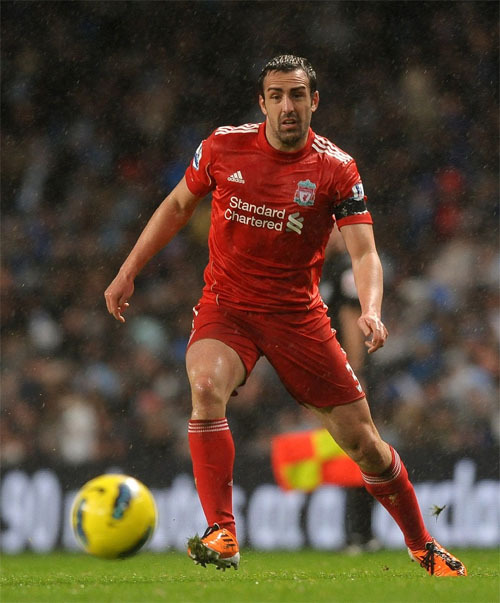 Less than two months had passed since the two teams played out a thrilling 1-1 draw in the reverse fixture at Anfield. On that occasion, Liverpool could consider themselves unlucky not to have taken all three points following a dominant second-half performance. However, City had won all nine of their Barclays Premier League home matches heading into this one - the first of three meetings between the teams this month - and though Roberto Mancini's men were without a win in their last two outings, the Reds were well aware of the task facing them against the table toppers. The game got underway with Liverpool sporting black armbands in memory of Gary Ablett, who sadly lost his 16-month battle with non-Hodgkin's lymphoma on Sunday, while the travelling Kop chanted the name of the former Anfield defender. On the pitch, the Reds made an enterprising start to the contest - and perhaps should have taken an eighth-minute lead. Jordan Henderson threaded a pass through the City defence to send Stewart Downing bearing down on Joe Hart's goal, but the goalkeeper was able to get a strong left hand to the effort to prevent the winger from opening the scoring. It was a golden chance for Liverpool - and they were left to rue the miss even further on 10 minutes as City broke the deadlock. Possession fell into the path of Aguero 25 yards from goal and the Argentina forward's effort bounced under the dive of Reina to hit the back of the net. 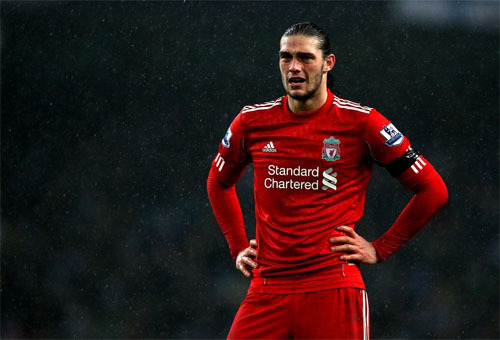 It was an uncharacteristic error from the Reds custodian, but he fared better to thwart Aguero soon after, while Andy Carroll flashed a header wide as the visitors went in search of an immediate riposte. The goalkeepers were certainly being kept busy - Edin Dzeko's deflected shot had Reina scrambling across his goal-line, but the ball spun wide of the target before Hart was required to parry Charlie Adam's free-kick. By the mid-way point of the first-half, Liverpool had seemingly recovered from the setback of conceding an early goal - and a free-kick in a dangerous position resulted in Jordan Henderson crashing an effort against a City wall. 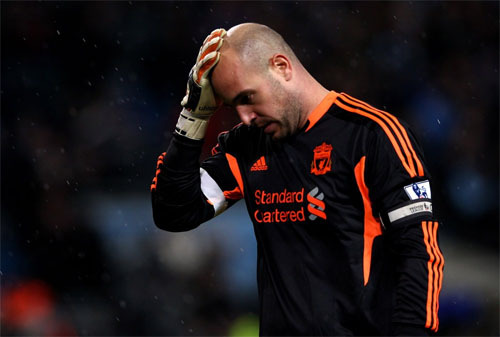 However, the Reds found themselves two goals behind on 33 minutes when David Silva's corner was met by a thumping header from Yaya Toure which left Reina with no chance and Dalglish's side with it all to do in the second half if they were to salvage anything from the game. 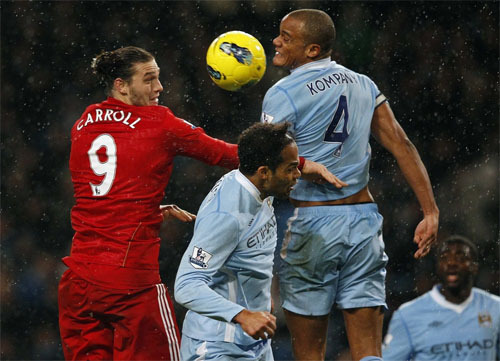 The deficit could have been smaller heading into the break, though, had Vincent Kompany not produced a brilliant block to deny Kuyt's close-range hook. 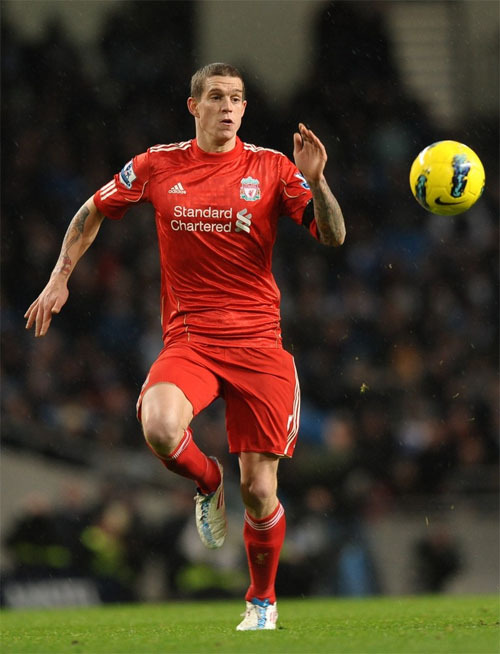 Liverpool began the second period enjoying plenty of possession as they set about probing the City defence - and Dalglish decided to throw Steven Gerrard and Bellamy into the equation before the hour, with the pair replacing Adam and Kuyt. The Reds continued to keep their hosts on the back foot, and Bellamy flashed an attempt wide of the near post after cutting inside onto his right foot. 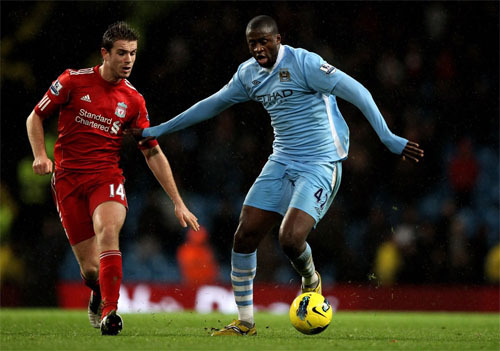 The visitors' hopes of securing a point were raised on 73 minutes when Barry saw red for a second bookable offence, but City hit Liverpool with a sucker punch two minutes later when a counter attack resulted in Martin Skrtel bringing down Yaya Toure inside the box. 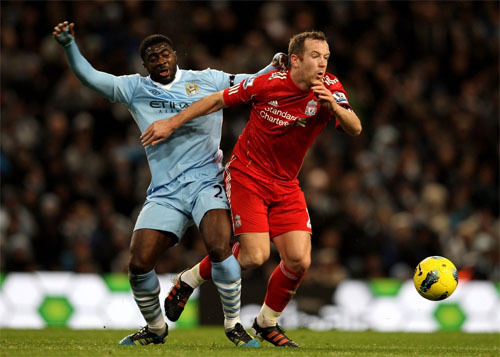 Milner stepped up to convert and secure the win, though the final scoreline was certainly harsh on Liverpool. Copyright © 2010 LFC_Stats. All rights reserved.